Yeah, we know that picture above is creepy. So was the first Insidious movie. And now, the team of director James Wan and writer Leigh Whannell have reunited with the original cast of Patrick Wilson, Rose Byrne, Lin Shaye, Barbara Hershey and Ty Simpkins for a sequel entitled, appropriately enough, Insidious: Chapter 2. This new movie follows the haunted Lambert family as they seek to uncover the mysterious childhood secret that has left them dangerously connected to the spirit world. Quick guess as to how that goes? We’re gonna guess not that well. For almost everyone. 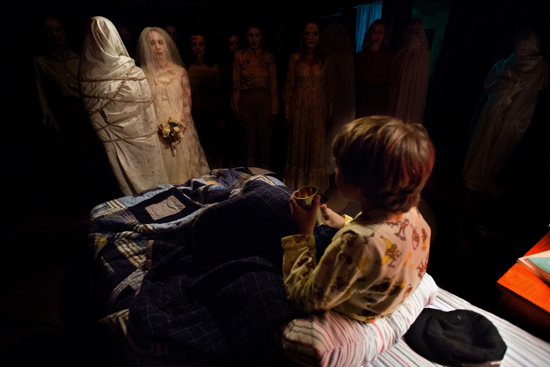 Look for Insidious: Chapter 2 to arrive in theaters on September 13. Watch the trailer after the break and prepare to be scared.